In some environments, specifically healthcare and clinical environments, it may be desirable to remove many of the self-service aspects of the Citrix Receiver. Nurses and physicians do not always have time to go through a registration/setup sequence. In these environments, it would just be great if we could do the following without user intervention. Unfortunately, setting up the Citrix Receiver so that users just get their applications was not intuitive since the Receiver and StoreFront services are designed to be self-service oriented and require user intervention. This configuration assumes all users are XenDesktop users and so they are already authenticated to the domain, allowing the use of pass-through authentication to minimize the user intervention. The environment also assumes using the latest versions of all Citrix Products, including CloudGateway Express 2.0 (with StoreFront Services 1.2), Citrix Receiver 3.3, XenApp 6.5, XenDesktop 5.6, and Provisioning Services 6.1. The store name and server URL must be identical to those found in the provisioning file. The best way I found is to save the Provisioning file (*.cr) from the CloudGateway Express server and copy and paste the strings for Store name (<Name>) and Server URL (<Address>)directly out of that file. 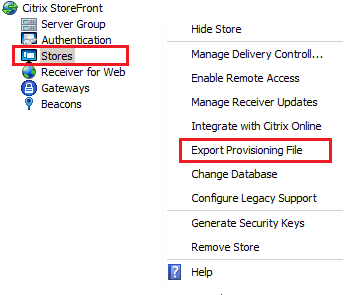 The provisoning file can be obtained by opening the StoreFront console and selecting the store then choosing Export Provisioning File from the Actions list from the StoreFront console as shown below. Note: If you want users to be able to add additional store locations or to support HTTP stores, you will need to add the parameter ALLOWADDSTORE=A to install command-line. 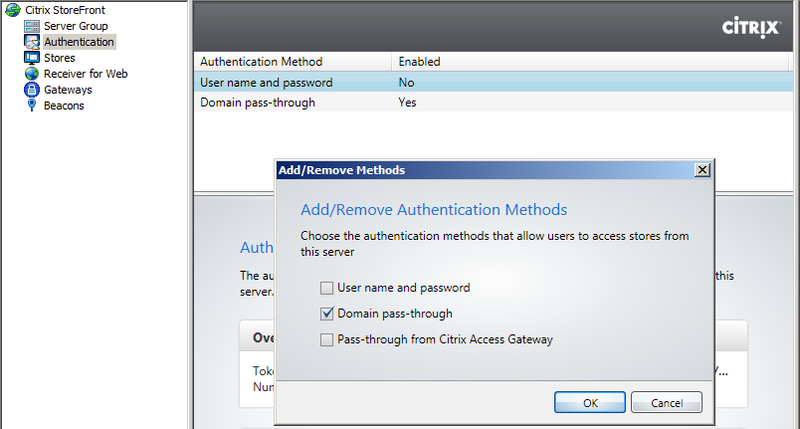 Also, for single sign-on to work correctly, you will need to open GPEDIT.MSC and add the ICAClient.ADM template from \Citrix\ICA Client\Configuration folder set the following policy. I looked briefly for a way to prevent the ConfigurationWizard from launching automatically for each new user. I did not see any setting in the icaclient.adm template. I could not find anything in the Startup folder, the RunOnce or Run keys of HKLM or the Default user. While it is probably in an ActiveX Stub somewhere, I was in a hurry, so I finally resorted to just renaming the ConfigurationWizard.exe (in both the Citrix\Receiver and Citrix\ICA Client\Receiver folders) to something else so it doesn’t launch automatically for each user. I am sure there is a better way to do this; I just haven’t figured it out yet. If you know it please post a comment with the better steps. When publishing the application, add the string “KEYWORDS:Auto” (without the quotes) to the description field. When the Receiver sees this in the application description, it will auto subscribe the application for the user and still hide the “KEYWORDS:Auto” string from the description. When the application needs to be automatically added for some users and not for others, just publish the application twice, using one group of users with the KEYWORDS:Auto in the description and leaving the other group without it. Incidentally, you can make these applications easier to find by adding the keyword “Featured” to the string separated by a space, so that your string reads “KEYWORDS: Auto Featured” instead. This shows the application in the Featured group at the top of the Receiver Application list. This step turned out to be the easiest of the three. Just go to the All Users Startup folder (C:\ProgramData\Microsoft\Windows\Start Menu\Programs\Startup) and add a shortcut to the Citrix Self-Service Receiver (C:\Program Files\Citrix\SelfServicePlugin\Selfservice.exe) executable. Now Receiver works more like the legacy PNAgent. J Of course, making it work like PNAgent does not mean you get all the features of PNAgent. For instance, if you need the Pre-Launch code from XenApp 6.5 that leverages PNAgent, for now you will need to use the Citrix Receiver Enterprise (with PNAgent) and Web Interface 5.4. If you liked this blog and want to be notified of future blogs, please feel free to follow me on Twitter @pwilson98. The author would like to provide special thanks to Jonathan and Brian for their contributions to these steps! Nice! That is what I was looking for. Thanks for that information.